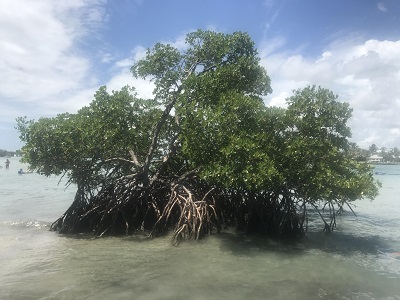 Ecological Restoration Notes: A key element of tidal swamps, especially in areas with good tidal flushing and lower levels of salinity. Description: Small to large tree or medium to large shrub with a flat topped and rounded or tall and narrow crown from wide spreading branches. Trunks tall and straight or short, 6-18 inches or more in diameter, perched atop arching prop roots. 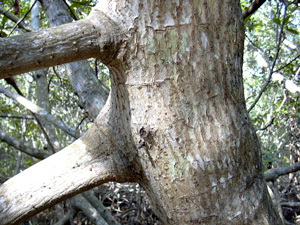 Bark smooth and reddish brown when young, becoming grayish, thick and slightly furrowed with age. 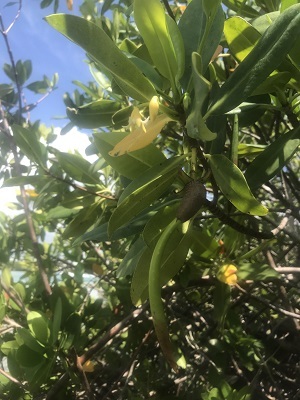 Leaves thick and stiff, dark green and shining above, 2-6 inches long. Aerial roots stout, characteristic in trees 3 years old and older. 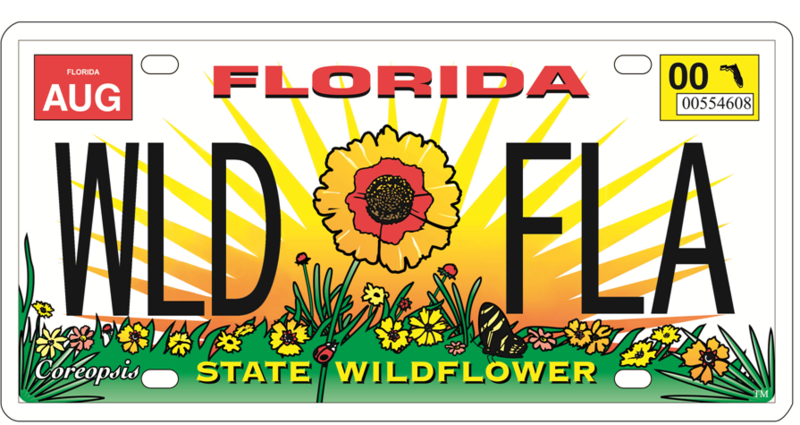 Dimensions: Typically 10-30 feet in height; to 75 feet in South Florida. Usually as broad as tall. Range: Monroe County Keys north to Volusia and Levy counties; disjunct in Wakulla County; West Indies, Mexico, Central America and South America. For a digitized image of Elbert Little's Florida range map, visit the Exploring Florida website. 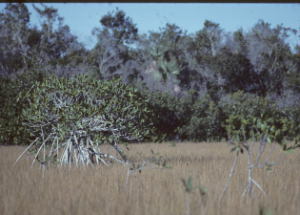 Habitats: Tidal swamps and marshes. 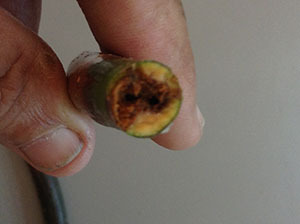 Soils: Wet, inundated saline to brackish soils. 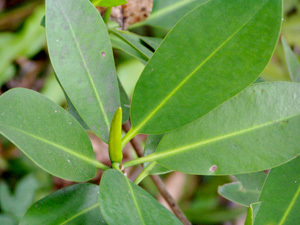 Flower Color: Yellowish-white petals and yellow sepals. Flower Characteristics: Inconspicuous. Pollination is by wind. Flowering Season: All year; peak June-July. 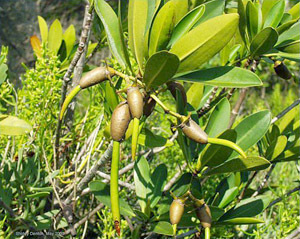 Fruit: Brown leathery berries, germinating into cigar-like seedlings while still on the tree. 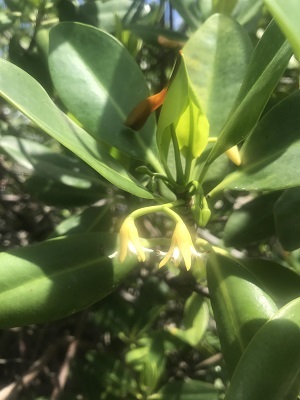 These fall from tree about one year following flowering. 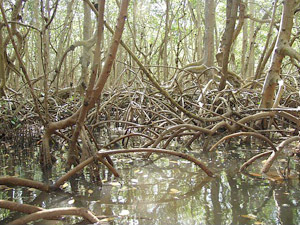 Wildlife and Ecology: An extremely important species of Florida's lower energy coastlines. 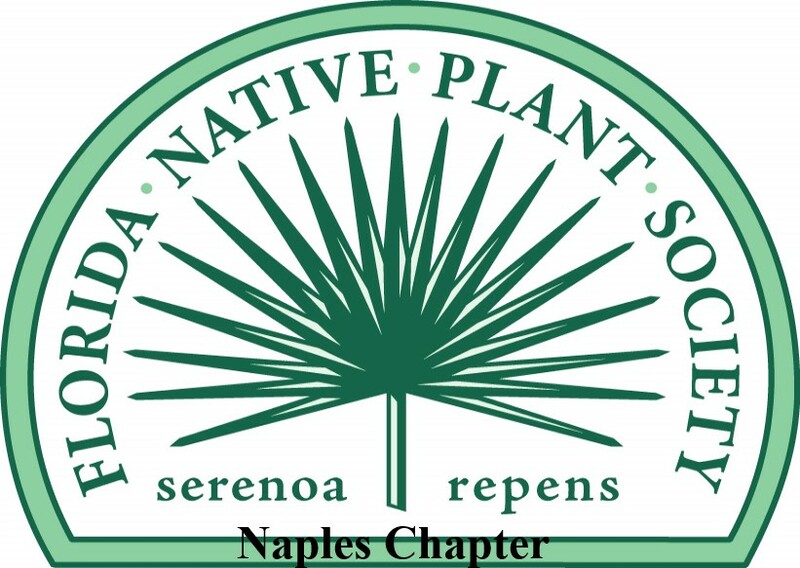 Provides food and cover for wildlife, especially fish, crabs, and other saltwater animals. 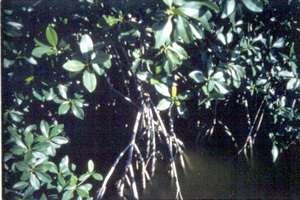 Larval host plant for mangrove skipper (Phocides pigmalion) butterflies and io (Automeris io) moths. 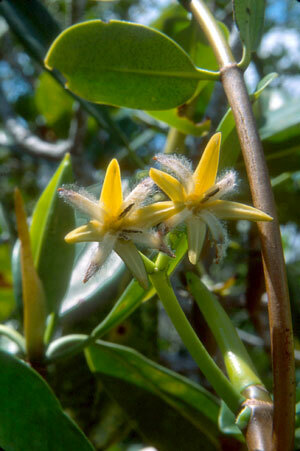 Nectar plant for mangrove skipper butterflies. Birds, such as egrets, herons, warblers, pelicans, white-crowned pigeons and magnificent frigatebirds, roost and nest in the trees. Bees may collect pollen. 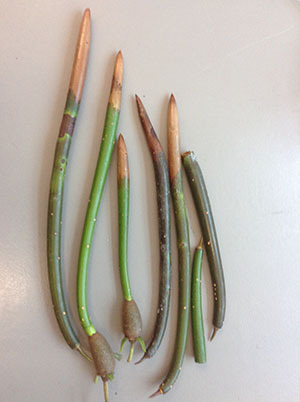 Horticultural Notes: Can be grown readily from seeds, which sprout on the tree (propagules). Can be grown in tubs as a house plant. 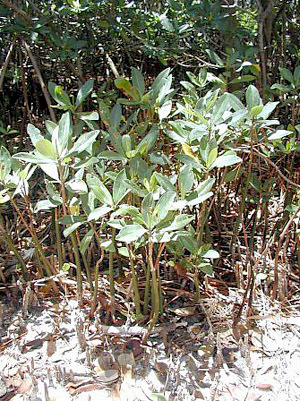 Comments: Tannic acid was harvested from red mangrove bark in Florida in the early 1900s.